Currently CrossFit Central (Austin, TX) operates eight CrossFit classes, two kettlebell classes, three corporate wellness programs, and ten boot camps in seven locations, coached by six CrossFit-certified trainers. Two years ago, this wasn't the case. Then, I was just a young man in a new town with big dreams and one non- paying training client. In that two years, I have gone from training people for free to training hundreds of people, creating unique opportunities inside corporations, and making a living at training. How did I attract so many people to my boot camps? 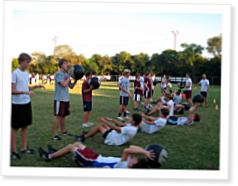 I based the CrossFit Central Boot Camp on a high school strength and conditioning program called PowerPlant. I was first introduced to intense training in high school. I experienced power lifting, Olympic lifting, plyometric jumps, and sprints, with a few bodybuilding movements mixed in. Inside the weight room, our coach placed a trash can in all four corners and one strategically in the center of the room--just in case. This was called Off- Season Football. The PowerPlant Summer Strength and Conditioning Program operates four days a week in the summer, combining strength and conditioning training with speed and agility work. Each day begins with a ten- minute warm-up and ends with a ten-minute cool- down. On a daily rotating basis, we do 45 minutes of lateral or 45 minutes of linear movements.